Friends are mourning the loss of an eastern Iowa college student and athlete who was killed in a boating accident in Colorado last week. Twenty-one-year-old Haley Rinaldi lived in Basalt, Colorado, but was studying biology at Mount Mercy University in Cedar Rapids. Authorities say Rinaldi was being pulled on a tube behind a boat last Friday at the Ruedi Reservoir near Aspen, Colorado when the tow roped snapped and the metal connector struck Rinaldi in the head. Her death has been ruled an accident. Rinaldi transferred to Mount Mercy from Waldorf College in Forest City last year and was member of the Mount Mercy women’s soccer team. 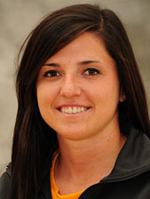 According to the team’s website, Rinaldi was named the team’s “newcomer of the year” in 2012. She would’ve been a senior at Mount Mercy this fall.